It’s a new year and a new beginning to AW First Fridays! Because it’s still resolution season, I’ve picked two nonfiction books to review: From Weakling to Warrior: A Bodybuilding Book by Jennifer Greenleaf, and The Pantry Cleaner: Chemical Free Cleaning by Mysti Reutlinger. One focuses on fulfilling a dream for yourself and the other focuses on doing something healthy for your family. I’ll admit it: I don’t know much about bodybuilding. 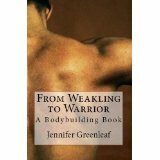 But Greenleaf’s book is perfect for the novice bodybuilder, and includes checklists and instructions on nutrition, exercise, and maintenance. Much of the content is common sense, especially if you’ve been up and down the weight loss path like me. Eat the right things, cut out the junk, and remember above all else to warm up and stay flexible. I also learned that how warm you keep your house can affect your bodybuilding efforts, and proper form in your training is the key to everything. I was impressed at how the author underscores the importance of gathering all the information before making a decision to bodybuild, from the cost of supplements and trainers to how much time and organization will be involved in maintaining those impressive pecs. If you’re thinking about bodybuilding or know someone who wants to do it, get this book for them. 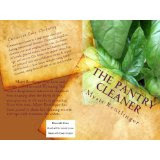 The Pantry Cleaner: Chemical Free Cleaning is an eye-opening book about the products you use every day, and how you get the same or better results with a few time-honored classics. Most cleaners have ingredients that not even a Harry Potter spell-caster could pronounce, and side effects including nausea, skin irritation and even impaired body organs. Reutlinger has included the Material Safety Data Sheets so you can see just how toxic some chemicals can be. Fortunately, the basic cleaning supply list is short and sweet, including ingredients you may already have, from olive oil to baking soda. I’ve used many of these ingredients and techniques myself, and they do work well. The diluted vinegar and newspaper approach for glass cleaning is effective, although I’ll add something so you can learn from my mistake: never do this to a car. Yeah. Not good. I highly recommend The Pantry Cleaner for anyone committed to living a greener or less toxic life, and I hope that she’ll come out with a sequel soon. Both books are available at Amazon.com in paperback and Kindle formats.